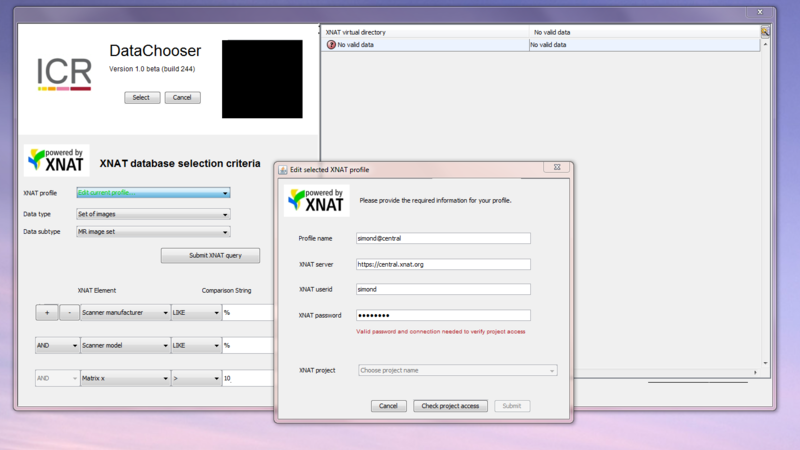 XNAT DataChooser is a client-side tool for browsing and selecting data from XNAT archives. It is designed to streamline the process of incorporating XNAT functionality into end-user applications and, in its simplest form, operates as a simple one-line drop-in for to replace a standard File -> Open… dialog. allow customisation of user experience. Installation should be a piece of cake. Simply copy the file to your home directory, and uncompress it there. Please make sure that the top-level uncompressed directory has name .XNAT_DAO (the dot is important) and resides directly within your home directory. Then take a look at README.txt. 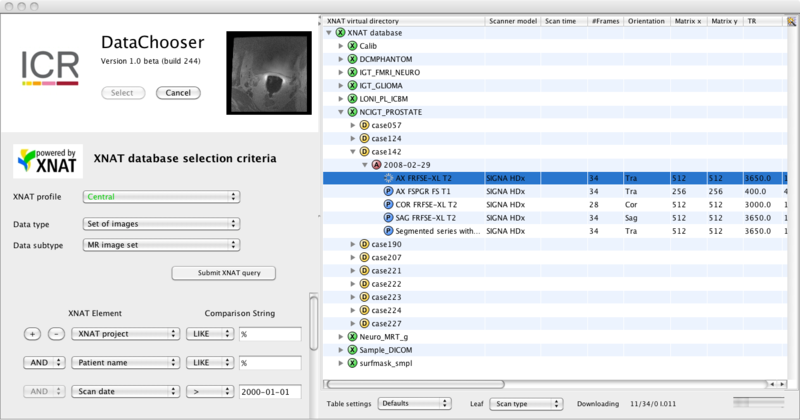 The software is currently running successfully at the Institute of Cancer Research, Sutton, UK, on the following platforms: Mac Pro, OS X 10.6.8 (Snow Leopard) Java(TM) SE Runtime Environment (build 1.6.0_43-b01-447-10M4203) Java HotSpot(TM) 64-Bit Server VM (build 20.14-b01-447, mixed mode) PC, Win 7 Java(TM) SE Runtime Environment (build 1.7.0_11-b21) Java HotSpot(TM) 64-Bit Server VM (build 23.6-b04, mixed mode) Linux, Red Hat Enterprise Linux Server release 6.2 (Santiago) java version "1.6.0_22" OpenJDK Runtime Environment (IcedTea6 1.10.4) (rhel-1.41.1.10.4.el6-x86_64) OpenJDK 64-Bit Server VM (build 20.0-b11, mixed mode) Tested with IDL Version 8.2, Mac OS X (darwin x86_64 m64). 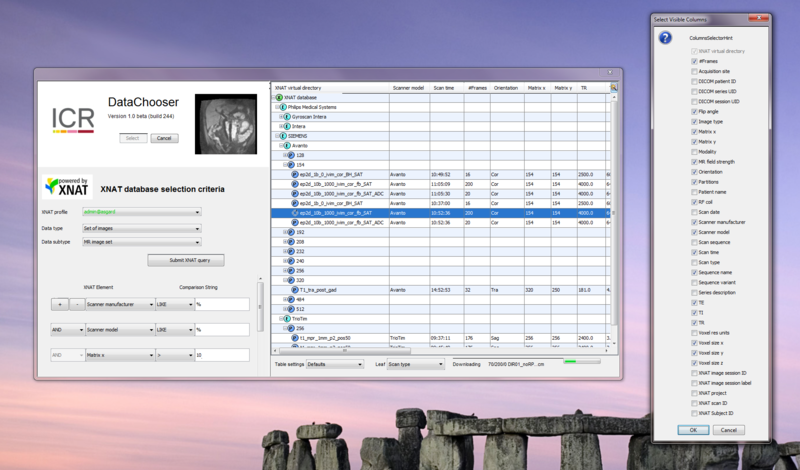 (c) 2012, Exelis Visual Information Solutions, Inc. and MATLAB R2012b (8.0.0.783) 64-bit (maci64) August 22, 2012 However, there is no reason to suppose that it will not integrate with other versions of IDL and MATLAB or that it won't run on any version of Java 1.6 or higher.